Although he’s been a lawyer for nearly twenty years, Robert Dugoni has been writing his entire life. He graduated Phi Beta Kappa from Stanford University with a degree in journalism and clerked as a reporter for the Los Angeles Times before obtaining his doctorate of jurisprudence from the University of California at Los Angeles School of Law. The author is also a two-time winner of the Pacific Northwest Writers Association Literary Contest. He has written two bestselling legal thrillers, The Jury Master and Damage Control, which have been compared to the works of Scott Turow and Stephen L. Carter. Just published by Warner Books, Damage Control features a female protagonist. Dana Hill is in a bad marriage and a bad job when her brother is viciously beaten to death in his Greenlake home. The police are telling her he died during the commission of a robbery, but she doesn’t believe it. The more she pushes for answers, the more some powerful people push back and everyone involved in her brother’s murder is turning up dead. Author Robert Dugoni is also beating a path to Bainbridge Island, Washington courtesy of the Field’s End Conference, “Writing in the Garden of the Gods,” on April 28. He will be presenting two workshops and signing his books at the say-long event. For more information, please see www.fieldsend.org and visit the author on the web at www.robertdugoni.com. I am in such trouble. I still haven’t come up with a title for my book. For me, this is either completely simple–it pops into my head right away and it’s perfect for the book and everyone loves it. Examples: Passing Through Paradise. The Charm School. Other times, I go for months without knowing what the book will ultimately be called. The whole time I was writing The You I Never Knew, it was known as Daddy Take My Kidney, Lover Take My Heart. Every once in awhile, we think we’re all agreed and I go public with a title and at the last minute, it gets shot down–either by someone at my publisher or by a buyer for a big chain of bookstores. There’s usually a good reason–maybe there’s already a book with this title, or it rubs the buyer the wrong way….This was a problem back when Talking to the Moon became Significant Others and ultimately, Table for Five. The decision was made after there was a “Dear Reader” letter published in the back of one of my books, saying “Please watch for Significant Others next year. I still get letters asking me whatever happened to Significant Others. Back to the present troubles. It’s a February book. The Catskills, a frozen lake, a lake-effect blizzard. Oh! I’ve got it! Lake Effect. Too perfect. But I’m told this is too cold and clinical for my warm and fuzzy books. We move on to Heart of Winter which I quite like, except it’s already been taken. Then I thought about the word Midwinter. Wrote it down. Circled around it. Imagined it on the one of my covers. It’s a good word for a February 2008 book, eh? So I went to Google and typed in “midwinter” to see if it would trigger any riffs or phrases beyond “In the bleak midwinter” which is a great phrase but it’s already been used. Messing around on Google is a dicey thing to do if you’re punch drunk from writing 3500 words and have never been that great at attention and focus. Because the next thing I knew, I was reading (with inappropriately deep absorption) about something called “Midwinter Pottery.” And suddenly I’m helplessly in love. I mean, look at this stuff. Anyway. I don’t have a title but I have a new obsession. I am in such trouble. I went away for the weekend–to Klipsan Beach–to find a title for my new book. My ever-wise editor wants it to reflect a) a sense of place and b) a feeling of escape. So I escaped to a place with a strong sense of place and I’m waiting for a lightning bolt of inspiration. You’d think after 30 books, I’d know better. The book will be published in February 2008. It’s another of the “Lakeshore Chronicles” books about the made-up Catskills town of Avalon. How do you find the right title for a book? Field’s End presents a one-day writers’ conference at the legendary Kiana Lodge on Saturday, April 28, 2007. Owned and operated by the Suquamish Tribe, in whose language “kiana” means “garden of the gods,” Kiana Lodge is a historic waterfront conference center surrounded by gardens, with its own private dock and beach, overlooking Agate Passage between Bainbridge Island and Poulsbo, Washington. This is a rare opportunity for anyone who loves the written word, a chance to spend the day in a very special place with other writers who truly care about the craft of writing. Past guests at our events include Dorothy Allison, Ivan Doig, Tim Egan, Karen Joy Fowler, Gail Tsukiyama, Elizabeth George, Erik Larson and Field’s End co-founder, David Guterson. This year’s conference features keynote speaker Malachy McCourt, conference opener Debra Dean, moderator George Shannon, workshop leaders Robert Dugoni, Clyde Ford, Mary Guterson, Priscilla Long, Kelli Russell Agodon, Katherine Ramsland, Veronica Randall, Garth Stein, Elsa Watson and Susan Wiggs. Eagle Harbor Book Company, a Booksense affiliate, handles book sales for our events. Writers abound at the first annual Field’s End Writer’s Conference, at a writer’s community founded in 2003 by novelist David Guterson on Bainbridge Island in Washington State. 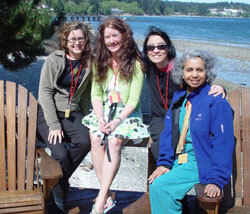 Pictured (l. to r.) are novelists Karen Joy Fowler (The Jane Austen Book Club), Susan Wiggs (Table For Five), Gail Tsukiyama (Dreaming Water) and Bharti Kirchner (Darjeeling). You’ll enjoy a day of inspiring workshops, the company of writers and Kiana’s incredible food. A full schedule of events is posted here. It is just a short distance to Chief Seattle’s grave and the Suquamish Museum, if you’re so inclined, or you can just relax somewhere with a good book. In the late afternoon, there will be a panel discussion followed by a wine & cheese reception and booksigning. Everything wraps up by 6pm. Early registration, until March 1, gets you a $15 discount. After March 1, registration is $150. The conference is filling fast, so join us soon. I want to go to Istria. Pardon me, I have to insert a quick kvell. Just had the nicest 3-way. On the phone, you guys, on the phone. My editor and agent called to let me know The Winter Lodge made it for a third week on the New York Times list and has even climbed several notches. Plus while we were on the phone, my agent (in Manhattan) spied a naked man out her window. Life is good. Also Puerto Escondido and someplace in the Bohemian forest where there are castles. And Nantucket. I’m afraid my literary agent will divorce me if I don’t get to Nantucket one of these days. Decisions, decisions. But here’s the thing. I live in the best place on earth. It’s easy to settle into a comfy inertia and not go anywhere. Then I remind myself of what happens when you travel–the things you see and the things that happen to you, the surprises you can’t plan for and the experiences you’ll never forget–when you step out into the world. So okay. I’m up for it. How do you choose where you want to travel? Cream butter and sugar; add eggs, one at a time. Add all the flavorings and salt. Add flour and baking powder. Mix only long enough to make it creamy. Add the dried fruits and nuts. Bake in greased and floured tube pan or loaf pan for 1 hour and 15-25 minutes, or until done, at 325 F.
A quick reminder – Booklovers’ weekend at the Ocean Lodge is coming up! There’s an article about it here. News flash and a huge, huge thank you to readers–The Winter Lodge is on the New York Times Bestseller list , Publishers Weekly and the USA Today list. On to our regularly-scheduled program…. I write the first drafts of my novels by hand. I’m just as particular about the paper as I am about the ink. I use only a Clairefontaine notebook–wire-bound, graph ruled–and peacock blue ink, which has lamentably been replaced by “turquoise.” The pastel-tinted paper is thick, with a silky writing surface, and putting the words down is a meditation and a pleasure for whole minutes at a time (I’m not one of those writers blessed with effortless first drafts). In French, the notebooks are called “velin veloute,” a reference to the smooth texture of the paper. When I’m working on a book, I tend to drag this notebook around with me everywhere. When it’s not with me, I try to keep it in a safe place, like in the freezer. So if there’s a fire, it’ll survive. Author Anne Tyler once said that writing a book in longhand is like “knitting a book.” Maybe, but I don’t think that hard when I knit. Note from a reader pretty much says it all. You can see more of my own “snow day” photos here. So in the grand scheme of things, this is probably not huge, but this month’s interview in “Heart to Heart” is something I’ve always wanted to do. Thanks to Ginger Curwen for interviewing me, and particularly for asking me a really good question about pivotal scenes. It made me think about the important moments in a novel, and how every choice the writer makes can affect the direction of the story. “Heart to Heart” started out as a publication for readers who shopped at the B. Dalton chain. Now it’s expanded to a web-based e-newsletter, but I was one of its first fans, way back before the Web. What I loved was that it featured interviews with some of my favorite authors, like Jennifer Blake, Laura London , Kathleen Woodiwiss and LaVyrle Spencer. There really wasn’t anything quite like it out there, so it was a chance to catch a glimpse into the thought processes of a working writer. Every writer I’ve ever met is convinced that her peers have found an easier way to get the book written. What I discover, in reading various author interviews, is that there are as many ways to write as there are authors–every one of them a tough challenge. And really, we wouldn’t have it any other way. News Flash! We’ll be talking about this event live or on the Web on KINK-FM on Thursday, February 8, at 9:00a.m. Tune in to 102FM in Portland, or listen on the Web. See you on the airwaves. For this writing exercise, the only assumptions were that a) everybody loves someone and b) everybody can write. In our diverse room full of people, we had women of all ages, a couple of well-behaved young husbands (any guy who would attend a workshop called “How to Write a Love Letter” automatically falls into the “well-behaved” category) and a kid who was more interested in the chocolate-syrup pump in the breakfast room than any stinkin’ love letter. In the back of the room was a burly man in a plaid flannel shirt, a red knit cap on his head and lace-up boots, with his sleeves rolled back to reveal beefy forearms. He held his pen like a blunt instrument. He was easily more than six feet tall and had the body of a linebacker. So I’m thinking, this better be good, because this guy could hurt me. The writing process for a simple love letter starts with brainstorming and visualizing. I encourage people to picture their loved one (sweetheart, mom, child, pet, anyone they like) and to jot down some key phrases and feelings that come to mind. Ultimately, the goal is for them to put their heart on paper in their own unique, sincere way. Everyone went about it with gusto. I looked at Paul Bunyon in the back of the room and was amazed to see him weeping. He wrote and wrote, longer than anyone else, his big shoulders shaking as his pen moved steadily across the page. Then he blew his nose, gruffly thanked me and ducked out. I found myself envying the recipient of that letter. The Ocean Lodge tends to have that effect on people. It’s a place so close to the edge of the world that you feel as though you can touch infinity. People who don’t ordinarily write things pick up pen and paper. Unartistic people grab or pastels and sketchbook, and non-athletes find themselves taking a beach walk or hike with a camera. That’s what an Ocean Lodge Event is all about. I have one coming up later this month. Please join me for a reception, booksigning and writing workshop in this magical place, February 23-25. My publisher sent me to an event in Portland called the ABA Winter Institute. It’s a meeting of independent booksellers who seem to care more about what goes into creating a fabulous author event than they do about the countdown to the superbowl. The author reception and booksigning featured writers with books just out, or galleys to give away. My favorite kind of signing–the books are free, and the room is full of avid readers. What’s not to like? I made a new friend–Pam Jenoff, who is adorable and talented–got to visit with an old friend–the amazing Cassandra King, introduced myself to a writer I’ve always admired, Frank Deford. He gets the prize for best-dressed writer ever, anywhere. Eat your heart out, Tom Wolfe! There’s a slide show of the event here. I came home with some incredible-sounding books– The God of Animals by Aryn Kyle, The Society of S by Susan Hubbard, Cassandra’s Queen of Broken Hearts, The Dead Father’s Club by Matt Haig and Pam’s debut novel, The Kommandant’s Girl. So guess what I’ll be doing during the Superbowl? Decisions, decisions.